Waitress the Musical Pie Recipe – this chocolate oasis pie is a tribute to this musical. Made in mason jars these are perfect for get togethers. This Waitress the Musical Pie Recipe is another result of my recent trip to New York. Since I was staying a full week, my sister joined me for the weekend and we knew we wanted to go see a play. I let my sister pick because I’ve been to New York before and have seen several shows so I wanted her to see something she would like. 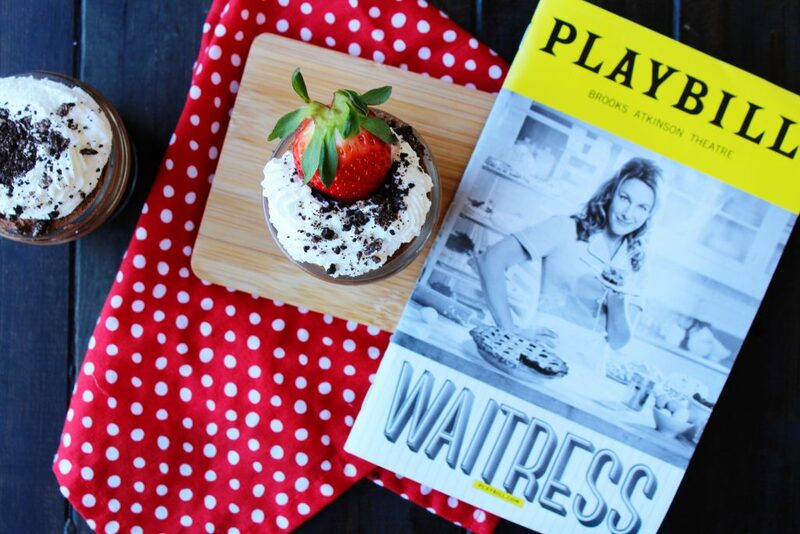 Being the sweet, generous sister that she is, she chose a play she knew I would love, Waitress. I had never heard of the play so of course I had to google it. It takes place in a diner and all the characters are a hoot. I especially loved that the play centered around pies and desserts. The theatre actually has a pie baking in the back so when you are leaving, the smell of pie baking wafts through the entire theatre. 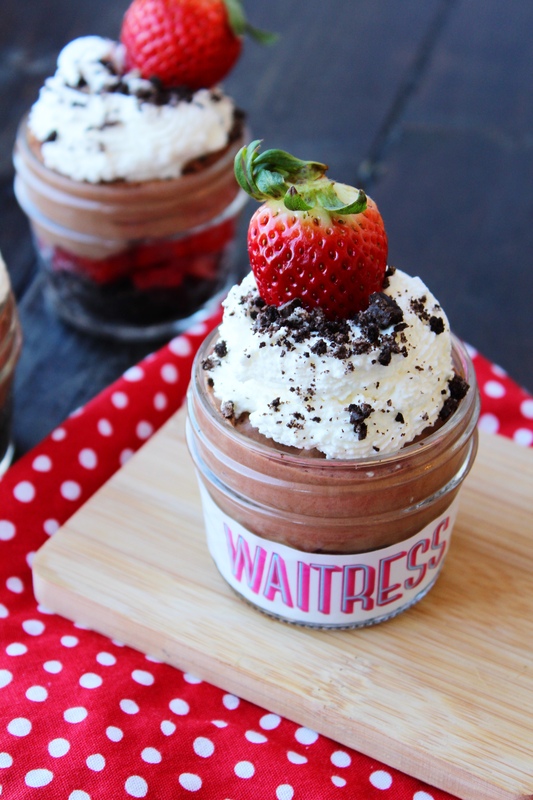 They also sell various pies in mason jars before the play and during intermission. 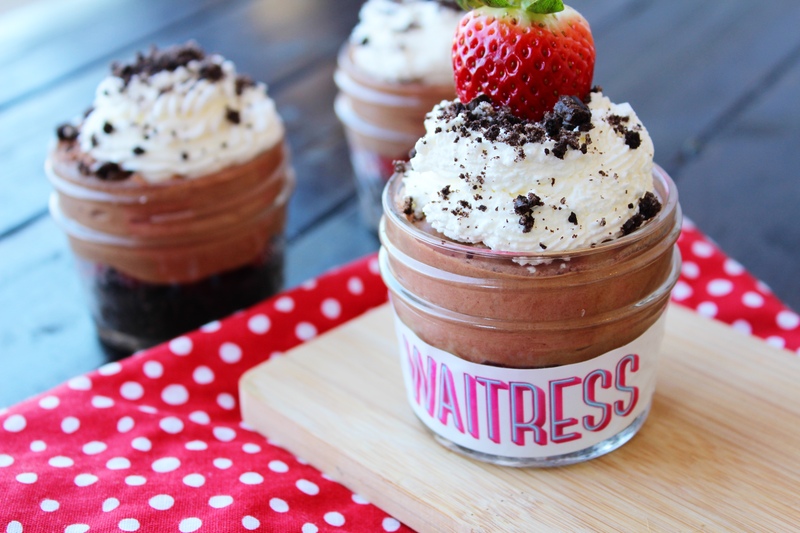 Of course I had to make some pies for you because mason jars are my jam. And so are pies. This recipe is adapted from the shows Pie Consultant via a People magazine article. Where do I apply to be a pie taster? I’ve been practicing my whole like for that position. Give this Waitress the Musical Pie Recipe a chance and get ready to make these for BBQ cookouts or your next party. Waitress the Musical Pie Recipe - this chocolate oasis pie is a tribute to this musical. Place cookies in a food processor and pulse until very fine. Add butter and continue to pulse until completely combined and begins to clump together. Spray 7 mason jars with cooking spray. Evenly divide mixture among jars and press mixture down and up sides of jars. Bake in preheated oven 5 minutes then cool completely on a wire rack. Bring 1/2 cup cream to a simmer in a saucepan over medium heat. Add hot cream and vanilla to chocolate chips and let stand 2 minutes. Stir gently until chocolate melts. Allow chocolate to cool completely, stirring occasionally. Beat 1 cup cream and 2 Tbsp sugar with an electric mixer on medium speed until stiff peaks form, about 5 minutes. Gently stir 1/2 cup of the whipped cream into chocolate mixture until incorporated; gently fold in remaining whipped cream. 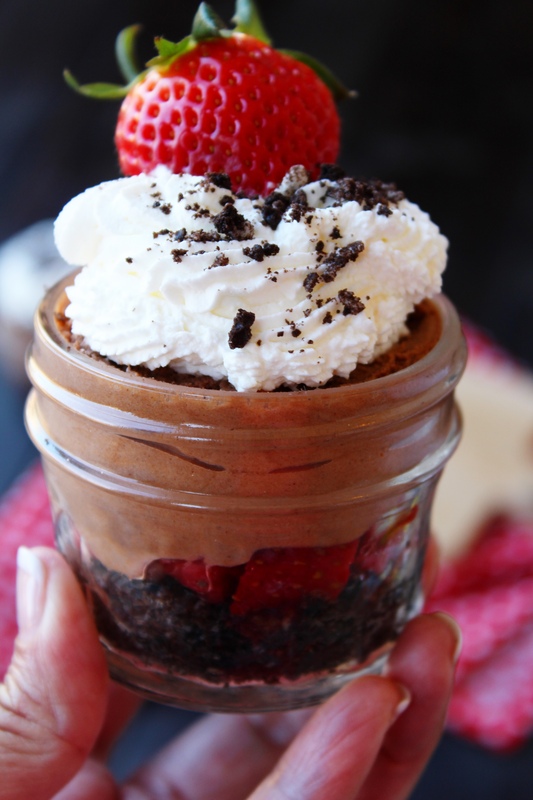 Arrange halved strawberries in an even layer on bottom of mason jars. Spread chocolate mixture over strawberries. Chill 6 to 24 hours. Beat remaining cream and sugar on medium speed until stiff peaks form. Pipe or dollop over chocolate mixture. Garnish with strawberries and cookie crumbles, if desired.